The Japanese version of Fused has an extra track “Let it Down Easy”. However, it’s not listed in the English notes section, or the back cover art. It is however, listed in the Japanese insert. The European iTunes version of Fused has an exclusive track, “The Innocence”. The version available for purchase from Rhapsody had an exclusive track, “Slip Away”. As of July 2011, it appears to be not available (legally, anyway) anywhere now. There has been to date, no single pressing of the Fused album that had all the three extra tracks in the same place. 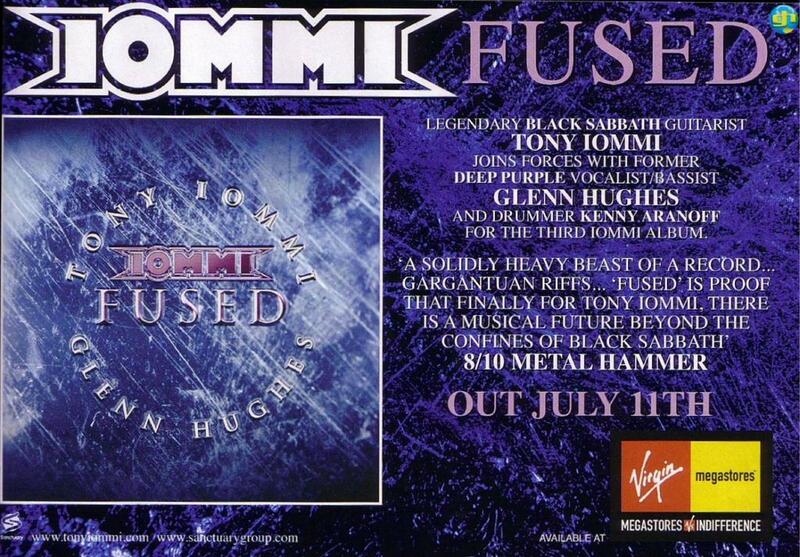 Tony Iommi, the man behind Black Sabbath for so many years (that didn’t stop in 1979, folks) has a new album out. It’s brilliant – but that should be no surprise to anyone who is a fan of his. 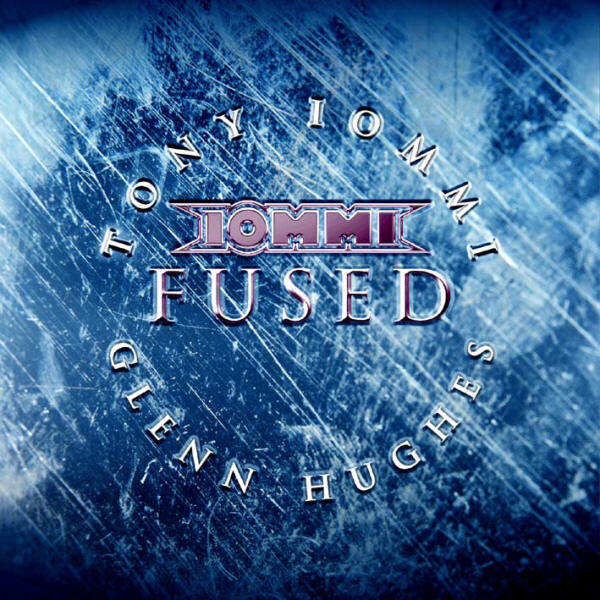 Fused is the name of the new one, and it’s the third collaboration between Tony & former Deep Purple and Black Sabbath singer Glenn Hughes (the others being the 1986 Sabbath album “Seventh Star” and 2004’s “The 1996 DEP Sessions”). Fused is probably the best of the lot; Here’s my track by track summary of “Fused”. Dopamine – The opening of a new album of Tony Iommi riffs. It’s like the needle going into the vein (not that I know what that means, I’m just using a metaphor). Interesting that the subject of the lyrics is a “drug” produced by one’s own body. Anyway, it very much sounds like a traditional Tony Iommi riff and song. Good way to open the album, even if it’s not my favorite track on the album. Wasted Again – Hmm.. Based solely on the titles, this is an interesting one to follow “Dopamine”. This is a slower song, although not “slow” – slower in comparison to Dopamine. It does feature some good “screaming vocals” by Glenn Hughes. It’s one of those tracks I like, but I can’t give you a concrete reason as to why. Just liked it. Saviour of the Real – This is one of the few songs on the album that doesn’t stick out to me. It’s not bad, but there’s no killer riff, no killer vocal hook on this one. Sometimes with songs that don’t stick out to me, I want to skip them, but I keep this in here because it is decent, it’s just not great. Resolution Song – This one starts out slow like some of the good moodier Sabbath tracks from the past. There’s a interesting vocal hook in this one. Not sure how to describe it except it comes in at about 1:44 for the first time, and sounds like “Ah-yee-ah”. It’s one of those good Iommi tracks that’s mostly mellow, has a big powerful guitar sound behind the chorus. Grace – The first few times I listened to this album, I felt Grace was just ore of Resolution Song. The starting riff of this song sounds a lot like the end of the last song. Grace is one of the best songs on the album. Great lyrics, great riffs, great vocals. About halfway through the song there’s a guitar bit (starting around 2:51, runs for about 15 seconds)) that sounds a whole lot like a classic Sabbath riff from the Dio era (Southern Cross?). Anyway, after that, the big fast meaty part of the song really kicks in, and it’s just awesome till the end of the song. One of the album’s highlights. Deep Inside a Shell – This is the other one that doesn’t really leap out to me. As with Saviour, there’s nothing wrong with the song. It’s good. But it doesn’t just have that killer hook for me. The guitar solo midway through the song isn’t a standard Iommi power solo. From that aspect it’s something different – but this doesn’t leap out as a real highlight. What You’re Living For – This one is another of my favorites. It’s to me is a classic Iommi song, as it leads off with nothing but a cool riff, and just keeps going. It’s fast, it’s catchy, and is a great song. When I first started listening to the album, this was one of my favorites because it’s immediately accessible. I love the solo in this one, it’s one of those “Dual solos” where Tony’s playing more than one riff at a time. Really nice sound to this one. Face Your Fears – A nice crunchy Tony riff is at the heart of this song. This one seems more geared towards Glenn’s vocals than Tony’s playing. Nothing wrong with that, but it isn’t the “busiest” song in terms of Tony’s playing. The Spell – Nice heavy doom sounding riff to start off this song, like some of the classic early Sabbath stuff. The slowest song on the album. I Go Insane – I’m not worthy! I’m not worthy! This is by far and away the best thing on the album. A 9 minute and 30 second spectacular piece of music. The vocals, the… aw hell. This is the best song on the album. It’s so good, I can’t think of any good words to describe it. The best song Tony’s recorded in ages. In terms of “feel” it reminds me of the track “Kiss of Death” off of Sabbath’s last studio album from 1995, Forbidden. Both of these tracks have a sweeping majestic feel to them that outclass anything else on the disc they appear on. Let it Down Easy – This is the extra track for the Japanese version. It almost sounds like a Whitesnake track with Iommi playing. The vocals remind me a lot of David Coverdale for some reason. Glenn’s vocals sound different than on the other tracks on the album. This is more of a fast driving song, yet still has a very bluesy feel to it. The guitar solo is quite cool, has some “wah-wah” in it that I rather like. Will probably be a shame most people don’t get to hear it, as it’s the song that’s only on the Japanese version of the album. When this album was being recorded, there were some quotes by Tony Iommi saying he was really excited about the material on the album, and I can see why. This is probably the strongest of the three albums he’s recorded with Glenn Hughes, and I think this is his best solo album by far (over DEP Sessions which I thought was fabulous, & the decent if not awesome “Iommi”). 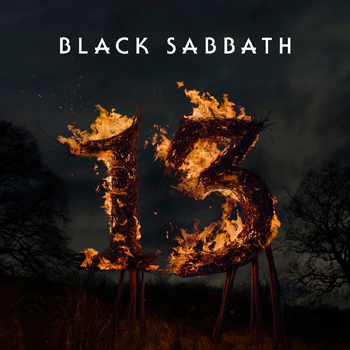 If you’re a fan of Black Sabbath, the number one complaint fans have is that Black Sabbath hasn’t put out a new album in the last 10 years. The last Sabbath album was released June 8, 1995, it’s been far too long. In all that time and all the albums released by the various members, this one is the one that has that feel of carrying the Sabbath banner best. “Fused” flies the legacy of Black Sabbath and the mastery that Tony Iommi has over the fret board magnificently. There’s little weakness on this album, it’s strong from start to finish. If you have ever considered yourself a Black Sabbath fan, you owe it to yourself to buy this album. What’s unfortunate is that the “pseudo fans” who know Sabbath only as Ozzy’s backing band (or only know Oz from his MTV show) won’t buy this because it doesn’t have Ozzy on it, and doesn’t have the name Black Sabbath on it, and that’s a crime. Buy this. Buy two, and give one to a friend. This album deserves all the attention it can get. You can buy it with the links shown on the top of this page. THIS IS THE uNITED sTATES CALLING ARE WE REACHING? 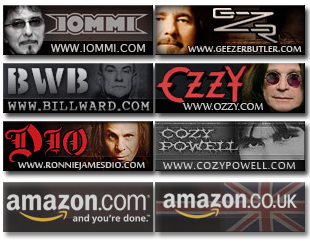 When you spoke of the “pseudo fans” who know Sabbath only as Ozzy’s backing band i felt adressed. But since the TDYK and the last Ozzy solo albums (which I am very disappointed) I have a closer attention to Iommis complete work. I’ve bought this album a few days ago. What can I say: This is the best album I have heard from the Riffmeister since Dehumanizer. Even 13 and TDYK have not this freshness & heavyness. They both are far away from the classic Ozzy / Dio masterpieces. But Fused is a real classic, even makes Seventh Star look like a shadow of itself! Excellent album, very heavy, top class Iommi riffing. As good as H.C, C.P, Dehum, TDYK and 13. Superb vocals from Hughes, very modern/up to date sound. Wasted Again reminds me of Gillan and Born Again, excellent screams from Hughes. I Go Insane is EPIC, total class, weaves in and out of light and heavy, classic Sabbath. Iommi is able to open up with technical riffs as he has a class vocalist to work with him, Ozzy wouldn’t have a chance sorry! Wish they had toured this album, they could have easily re created Dio and Martin era’s aswell-I would been there in a shot! The whiners who moan “oh its not Ozzy/its not Dio/wheres Bill?” etc etc miss out on another madterclass of brilliant heavy music – shame on them! Good to see this record getting some love. This and the Dep Sessions have been two of my guilty pleasures, but maybe I don’t need to feel guilty; they really are good records. This is the album that made me love Glenn Hughes, I struggled to get into Seventh Star (and the Tony Martin stuff) because of the overly 80s production, seemed too cheesy to me in retrospect. I really hope they collaborate again, because this album was immense, great riffs/solos, insane singing. Just really good sonwriting. What You’re Living For was also one that stuck out to me due to being up tempo and guitary, but I like all the songs.